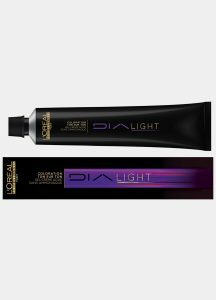 L’Oréal Professionnel presents Dialight, your ticket to trendy and personalised Balayage colours. If you have been eyeing one of the looks from L’Oréal Professionnel’s #COLORMEFRENCH collection, it’s time to go for it with Dialight. Dialight is a unique acid-gel cream, ammonia free tone-on-tone colour. It creates glossy luminous looking reflects and vinyl shine. The pH acid formula of Dialight is close to the natural pH of the hair. This makes it ideal for previously coloured or weakened hair. It’s the perfect product to give your hair a glossy makeover. It can be used for toning, colour correction and for highlights on sensitised hair. The Dialight range has 14 unique shades, which can help you achieve the cool Parisian look. Dialight colours are also your go-to option in-between permanent colouration services, as they refresh the vibrancy of your colour. Your personalised #FrenchBalayage is now just a salon appointment away. Inspired by cool tones of ash-gold and styled to be effortless, the Cool Caramel Balayage look is created with Majirel 6.13 and the new Dialight 9.02. Designed with the versatile INOA Mocha shade of 7.18 and the new Dialight 9.13, the Cool Mocha Balayage captures the quintessential Parisian Café Mocha.